Core de Force is NOW Available! FREE SHIPPING + Bonus DVD option. What could you accomplish in 30 days? How about getting into knockout shape—with the mixed martial arts-inspired workout designed to slash inches off your waist, blast away belly fat, and carve total-body definition! Introducing CORE DE FORCE! Build your knockout body even faster! On top of everything in the base kit, the CORE DE FORCE DELUXE KIT includes 3 additional agility ladder workouts that blast through calories while sculpting your glutes, thighs, and calves. You’ll also get a set of portion-control containers that works with your Eating Plan to make meal prep even easier for the next 30 days—and beyond! Very exciting news! 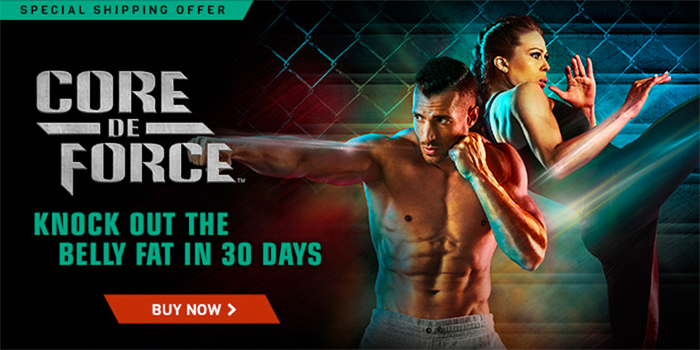 Beachbody has released Core de Force, the new mixed martial arts workout program you might have been hearing about. MMA workouts are becoming very popular and for good reason, they’re FUN and EFFECTIVE! If you “get in the fight” and work this program with good nutrition, get ready for fantastic results! This program requires ZERO equipment, just body weight exercises and MMA style cardio. The two super trainers, Joel and Jericho, have been doing this business together for a long time. Together they have held Personal Training Certifications from the American Fitness Association of America (AFAA), the American Council On Exercise (ACE), and the National Academy of Sports Medicine (NASM). But more than just a bunch of letters behind a name, they are a couple of cool trainers that know how to help you get results. I have had the opportunity to try Core de Force before the release, and I can testify that these guys are solid in there approach and program! This is one you want to check out! If you’ve never done a MMA style workout before, you feel a confidence boost, body and mind. You have to try it to believe it. Joel and Jericho combine Boxing, Kickboxing, and Muay Thai… with this mix you burn calories and burn off the body fat too. This workout is for everybody. Regardless of your fintess level, you can ramp up the intensity or tone down the intensity to your individual level. There’s even a modifier to keep you where you need to be if you are just starting out and need help. When I did a trial workout of Core de Force I noticed that there was no fancy choreography. No trying to keep the pace of a specific beat. You work out at your own pace. The workout style is broken down to “rounds”. Each round lasts for 3 minutes. The concept is to go at your best intensity for each round. You can do this workout! The Core de Force program includes 4 MMA-inspired workouts, 2 bodyweight workouts, 2 stretch workouts, an Eating Plan, a Quick-Start Guide, a 30-Day Calendar, plus 2 bonus core workouts — all for $59.85. Say what! Thats affordable, the price is right, and the workouts last between 30-45 minutes. It’s time to get in the fight. Check out the links above and get started! I know how hard it is to stay on track, I’m human too. Sometimes you need a little extra motivation or advice. When you purchase from the links above, I will be assigned as your fitness coach. I’m here to help! This program is 30 days. After your complete the first 30 days, you can order the deluxe DVD or upgrade package (links above). Both of those options have advanced workouts to mix into the program as well as a deluxe calendar. How long are the Core de Force workouts? All of the Core de Force workouts are between 27 and 47 minutes in length. 1 quick before-bed stretch routine. Plus one bonus workout when you purchase from Extremely-Fit. You can probably do Core de Force in your living room, that is if you have a 6′ – 8′ square. Obviously the more room the better, but your can improvise. Does Core de Force require equipment? No equipment is needed. Cool right?! My number one supplement is Shakeology. You can learn more about that here. Trust me…. it’s worth it! Ask me if you have questions. NextWhat Do Super Trainers Have For Breakfast?